At the very end of April our one year wedding anniversary rolled around. It’s been one whole year since I stumbled down the aisle of that cute little ceremony room in Rothley on a warm Sunday morning on less than four hours sleep to officially become Mrs. Eaglestone. I can hardly believe it! Although I’d known and been planning a date night with my husband for our anniversary the day itself just seemed to fall upon us. It honestly felt like it was only yesterday I was wrestling two hyper little girls into their dresses and struggling to stick false eyelashes on without blinding myself at the same time in a cramped room full of six women getting dressed. The drama! We didn’t do a lot for our anniversary because I’ve been struggling with some health problems for the past few months and Rick hasn’t been too dandy himself either, so we just booked ourselves a table at a recommended Indian restaurant in town and dropped the kiddo off with my Mum and Dad for the night. We had a few drinks (I say ‘we’, I haven’t been able to touch a drop of alcohol for nearly two months… ) at a local pub around the corner and then we sat down to a delicious curry for two, including an extensive pickle tray – yum. 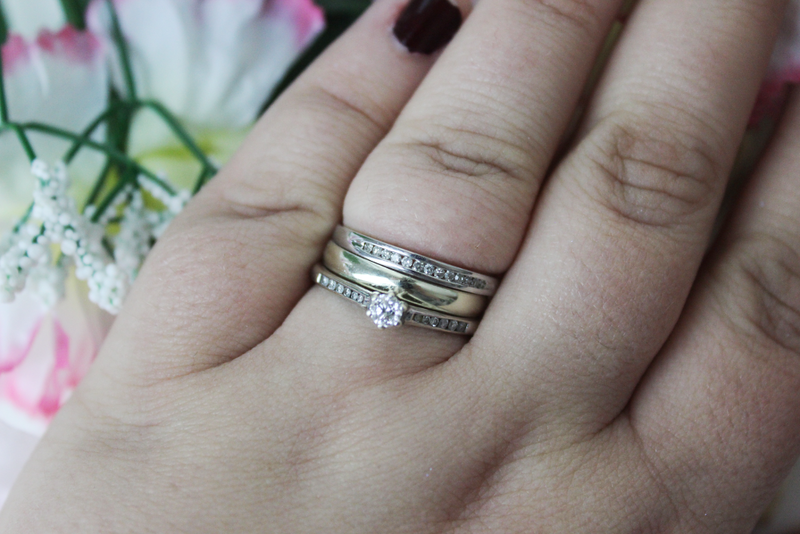 As Rick handed me a promised eternity ring that I knew I would be gifting since last November when I picked it out, I realised that my engagement and wedding rings have a little bit of history them already, and they’re not even that old. I don’t wear my origional engagement ring anymore because I was gifted a replacement last Christmas. We’d only been together for about six months before we discussed getting engaged when we lived in our tiny bedsit in Cardiff (all I can recall of that flat now is the awful mould!) and we didn’t have a lot of money. I’d picked out plenty of rings and and I made sure Rick knew the type and style of ring I wanted. I’ve never liked yellow gold so I imagined a silver ring with central diamond adjourned with smaller jewels making up the twisted band – but the problem was that the types of rings I really liked were in the £600+ region and we just couldn’t afford anything like that. I distinctly remember watching an advert for H Samuel on the telly shouting about engagement rings for as little as £149 just before Christmas in our first year together and pointing out to Rick which one I would prefer if he just happened to want to forgo my expensive tastes. I thought nothing of it for a few weeks until Rick came home one day looking like the cat that got the cream. He ran me a bath, told me to get changed into some fresh PJs he’d picked me up from Primark (the quickest way to my heart tbh) and then let me soak for a good half an hour. Next thing I know he’s playing Elle Goulding’s How Long Will I Love You into the bedroom and getting down on one knee – and crying. There in his hands is the ring, the one I’d pointed out from the advert and very vaguely mentioned and forgot about to be honest. I was happy to be engaged, never mind the cost of the ring and I wore it for over a year and when we married in April. I chose a simple court-style wedding ring to accompany it in white gold but the band was so thin and the setting of the teeny diamond so high that I often caught it at work and it tended to get on my nerves so we often discussed replacing it for something else even before we got married. I think Rick wanted me to own something that was a little more substantial than the cheapest the jeweller could offer at the time to be honest. In November we popped into a H Samuel (shout out to the babes working in the Loughborough branch) on the vague notion of having a look and then walked out with a new engagement ring and an eternity ring for our first anniversary this year. 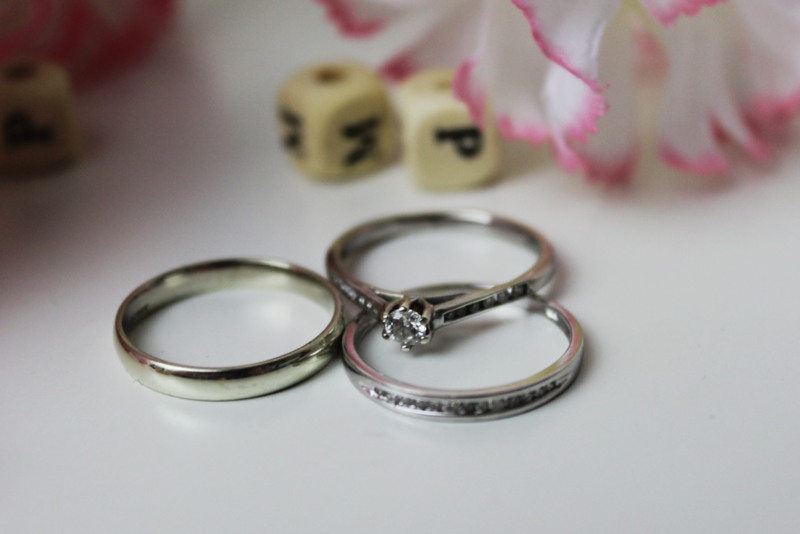 Even though they look like they do, both rings aren’t part of the same set but they really compliment each other. The diamond in my new engagement ring came with it’s own velvet casing and a laminated certificate authenticating the quality of the jewel – swanky. The funny thing is that my second ring is nothing like the style I originally wanted and is actually similiar to my first engagement ring which is now sitting safety in one of our bedside drawers to be passed on. As soon as I tried it on I knew it was the one and I love having the trio on every day. Now, if I could just get used to my ring finger clicking all of the time when the rings meet as I use my computer at work I’ll be flying. Nonetheless, I’m still in that glowing stage of looking at my rings glisten in the sunlight even though its twelve months later, it still feels awesome being married.